Make your stairs stand out. While we’re all for modern and minimalist design, there’s one time we’d rather not go bare—and that’s when it comes to our stairs. When you’ve painstakingly spent days outfitting the rest of your home, why leave this part as an afterthought? Between artful stair runners and cool ways to implement color, there’s a ton you can do to make your stairs design moments in and of themselves. Check out our favorite ways to do so, here. Bland staircase? A coat of paint offers cool contrast or an unexpected pop of color that’ll turn your drab stairs into a home highlight. Take a page from this Mediterranean-style home, whose black banisters pair perfectly against a crisp white backdrop. ICYMI, murals are having a moment—and when faced with an empty wall on your staircase, why not try your hand at the trend? A statement-making piece of artwork like this one in designer Raili Clasen’s home is the only thing needed to add a bit of interest to an empty white wall. Why not go even more dramatic and turn your artistic capabilities to the stairs themselves? This home, designed by none other than Leanne Ford, is a perfect example of how to do it. A sleek black base is the ideal canvas for funky graffiti; though feel free to try out a more minimalist design if that’s more your speed. Although this runner looks grey upon first sight, further inspection shows it’s actually a beige and grey mix… greige, if you will. The border gives it an interesting twist that helps it match both the flooring and the artwork in this gallery-style New Jersey home. Another great use of a stair runner? If your home is old-school with tons of wood, it can help eliminate that rustic feel. In this modern Chicago home, the beige runner lets the other patterns around the home (like the rug and cushion covers) take over instead. For a family, darker and more durable is always the way to go—in this colorful Texas home, the owner didn’t want that to mean boring. Her solution was picking a dark base with a fun print, and those colorful spots give it an almost safari-like quality. Sometimes, your home has so much already going on, you don’t want your stairs to make too big of a statement. In this Brooklyn abode, sky high ceilings and statement lights galore take center stage, so the minimalist runner draws your eyes up. A staircase that looks like artwork isn’t something you see every day. Thrown down and loosely affixed to a gleaming white staircase, the muted tones of this runner transform the entry into a masterpiece. It’s almost too beautiful to step on. We didn’t expect to see plaid on stairs. The home is comprised mainly of neutrals, making this interesting pattern a welcome surprise. It may even make doing laundry in the basement a bit more fun. 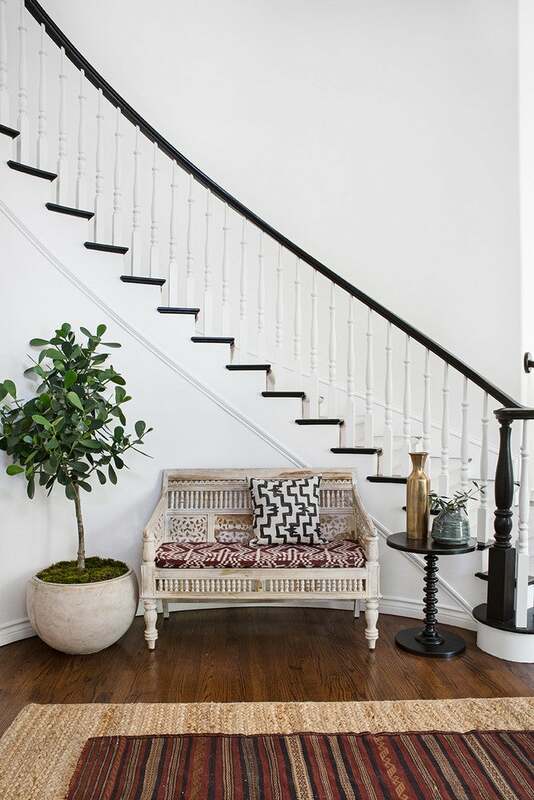 A navy herringbone patterned stair runner feels boho against an all-white background. The indigo tone works well with richly hued wooden steps and a navy and white rug—an inviting entry, to say the least. It’s so appealing, in fact, that a simple hat rack and matching basket are the only accessories needed. If the words modern and Victorian seem contradictory, take a look at this foyer. Fun and casual meet dressed up in a black and white interior with matching steps. Those stairs seem to blend right in. For a completely custom look, use rugs in a favorite pattern. This global textile is so modern and chic on painted white stairs. It keeps little feet warm and provides a non-slip surface, all while looking super stylish. Added bonus? This look can easily be switched out when inspiration strikes. This post was originally published on December 2, 2016. It has been updated with new information. Yes! I agree to the Terms and Conditions and agree to receive updates from Domino, The Inside, Artstar and Chalkboard Magazine. These cookies are used to collect information about traffic to this website and how users interface with this website.